Driven by gender discrimination, India ranks low in female literacy rates among developing countries with three million eligible girls out of school 1. The state of Rajasthan has particularly poor school access for girls. In rural parts of the state, a girl is more than twice as likely to be out of school compared to a boy. These statistics are a result of rigid social systems, limiting attitudes towards gender roles, and a lack of support from parents and communities. Educate Girls (EG) has found a way to channel village voices to improve the status of girls in marginalized regions of India and holistically tackles issues at the root of gender inequality in India’s education system particularly in rural, tribal, remote villages where the indicators for girls are the most severe. EG, in partnership with the government, creates community ownership (through an intensive, grassroots volunteer effort) that encourages enrollment and retention of girls in schools and ensures effective learning outcomes for all children through the utilization of a remedial, activity-based curriculum. In 10 years, Educate Girls has grown from working in 50 schools to over 25,000 schools (in Rajasthan and Madhya Pradesh) – growth that has been punctuated with intentionality, evidence, and focus. The model has been built upon extensive experimentation, testing and eventual codification. In 2015, through a collective effort, various stakeholders came together to support EG in testing their model for scaling for quality and results through the creation of the world’s first Development Impact Bond (DIB) in education. DIBs are a new philanthropic tool for financing social programs. A socially minded investor provides capital up front to a service provider and is repaid for its investment by an underwriter or an outcome payer based on the effectiveness of the program. By shifting the focus from inputs to outcomes and incentivizing service providers to improve programs, DIBs hold the potential to make social programs more effective. Investor UBS Optimus Foundation provided $270,000 in upfront capital while Educate Girls, the service provider, identified and encouraged enrollment for out-of-school girls, as well as provided learning interventions through a supplemental curriculum. 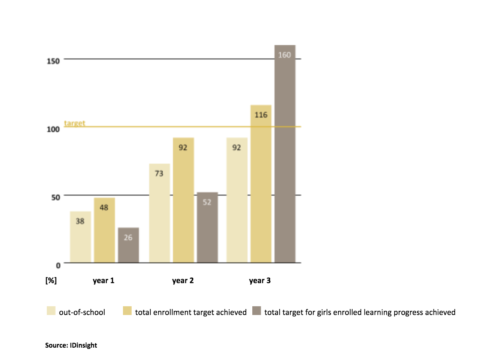 Instiglio provided performance management support to Educate Girls, and the results were independently verified by IDinsight. The outcome payer, the Children’s Investment Fund Foundation, (CIFF) paid UBS their principal along with an internal rate of return of 15 percent (since the predetermined targets were achieved). EG will receive 32 percent of the internal rate of return with the rest of the total payout going to other UBSOF programs. John King, the son of two New York City public school teachers, has served as a high school teacher, middle school principal, the co-founder of a Massachusetts charter school, New York’s education commissioner, and U.S. education secretary under President Barack Obama. King now is president and CEO of the Education Trust, where he leads an organization dedicated to the academic achievement of all students, particularly those of color or living in poverty. King also contends that the next phase of education accountability must go beyond rating schools and lead to better strategies for improvement. Students’ learning was measured in three proficiencies: Hindi, English and mathematics. The tests were administered to students before and after the intervention. The target over the three years was a combined increase of 5,592 learning levels for the students receiving the intervention, above the comparison group. This target proved much more difficult to achieve in the first two years, with only 52 percent achieved by the end of year two. The final year of the DIB saw a huge increase in learning outcomes for the students receiving the intervention through course correction, part of the flexibility of the DIB: by the end of year three, this group had improved their test performance by 8,940 more learning levels than the comparison group, equivalent to 160 percent of the target. Enrollment and retention are key elements in determining potential mind shifts in community beliefs. This metric, which accounts for 20 percent of the outcome payment, measured the percentage of out-of-school girls aged 7-14 enrolled in school over the course of three years, against a target of 79 percent. Over the three year intervention, 768 or 92 percent of eligible out-of-school girls identified in the program areas in Rajasthan, India were enrolled in school. The results from EG’s DIB provide strong evidence to support the hypothesis that giving autonomy (unrestricted funding) to high performing organizations to innovate and make necessary course corrections can help drive organizational focus to achieve outcomes. In addition, CIFF was able to reduce its risk by paying only for results. The key was UBS Optimus willing to take the leap of faith and monetize that risk by investing in Educate Girls. While the EG DIB proved that outcomes can be achieved by leveraging the private sector, it isn’t necessarily a silver bullet. Impact bonds remain complex, time-intensive and expensive. In this case, results were delivered on a relatively small scale (166 school in 141 villages) and costs increased from $5/child/year to $12/child/year for EG program intervention. DIBs cannot be the only answer. Engaging government participation to adapt some of the approaches and ideologies can lead to policy change, which results in long term sustainability. Gain a deeper understanding of impact bonds and how they work. Read the full report on Educate Girls’ development impact bond. Support organizations such as Educate Girls that focus on girls’ education in India and rely on outreach towards enrollment and increased learning outcomes. Original contribution by Swati Narayan, Director of Development for Educate Girls. Education is a fascinating topic, and others found these events, galas, conferences and volunteering opportunities aggregated by Giving Compass to be relevant for individuals with a passion for Education.